Critically ill infants in neonatal intensive care units (NICU) require constant monitoring of their vital signs. Invasive methods, such as using umbilical arterial catheters to check blood pressure, are the gold standard but pose significant health risks. Low-risk noninvasive monitoring, such as continuous cardiorespiratory monitors, can measure heart rate, respiratory rate and blood oxygenation. A noninvasive technique called near-infrared spectroscopy (NIRS) can gauge how well tissues, including the brain, are oxygenated. While NIRS long has been used to monitor oxygenation in conditions in which blood flow is altered, such as bleeding in the brain, how NIRS values relate to other vital sign measures in NICU babies was unknown. A research team led by Khodayar Rais-Bahrami, M.D., a neonatologist at Children’s National Health System, investigated this question in 27 babies admitted to Children’s NICU. The researchers separated these subjects into two groups: Low birth weight (LBW, less than 1.5 kg or 3.3 pounds) and moderate birth weight (MBW, more than 1.5 kg). Then, they looked for correlations between information extracted from NIRS, such as tissue oxygenation (specific tissue oxygen saturation, StO2) and the balance between oxygen supply and consumption (fractional tissue oxygen extraction, FTOE), and various vital signs. They found that StO2 increased with blood pressure for LBW babies but decreased with blood pressure for MBW babies. Brain and body FTOE in LBW babies decreased with blood pressure. In babies with abnormal brain scans, brain StO2 increased with blood pressure and brain FTOE decreased with blood pressure. 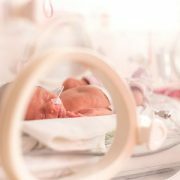 Together, the researchers suggest, these measures could give a more complete picture of critically ill babies’ health. Q: Can NIRS data be used as a surrogate for other forms of monitoring? Q: How could NIRS data help health care professionals intervene to improve the health of critically ill infants in the NICU? Source: “Significant correlation between regional tissue oxygen saturation and vital signs of critically ill infants.” B. Massa-Buck, V. Amendola, R. McCloskey and K. Rais-Bahrami. Published by Frontiers in Pediatrics Dec. 21, 2017.